Just a note about this bed: We are pretty sure it was my great-grandfather's bed. I'm kind of a purist when it comes to antiques, and I don't like to paint old furniture very often, but this had to be plastered in several places and it had to be painted if it was ever going to be enjoyed again. 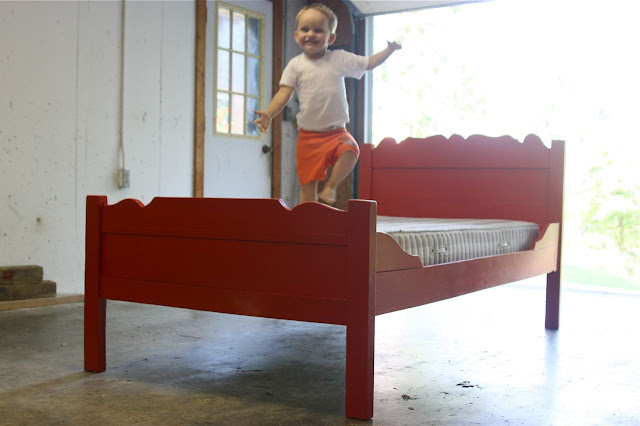 My dad and I had a good summer fixing it up and painting it together, which was special because it was his grandfather's bed. I'm so thrilled that Jude's first bed is such a meaningful one!